Human interactions with the environment include effects on the 'water balance' which can be described as the balance between quantities of water that enter and leave a system. 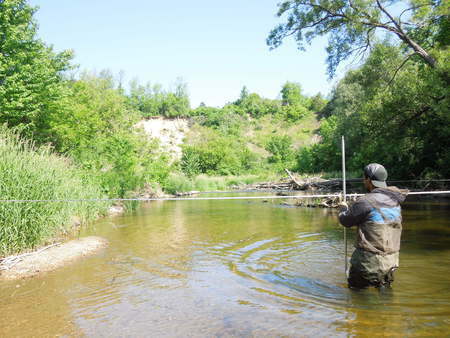 Dr. Jana Levison and her team in the Department of Engineering at the University of Guelph study water balances with a specific focus on groundwater dynamics and ecohydrology. A system that they have been studying for the past three years is Whitemans Creek and its associated watershed. Whitemans Creek is a tributary of the Grand River located in Brant County which supports a coldwater recreational fishery. The Grand River Conservation Authority, which oversees the health of the creek, has expressed concern over the high water usage in the creek's watershed which is mainly related to agricultural activity. In addition, fluctuations in precipitation, air temperature and evapotranspiration as a result of climate change can affect the volume of water in Whitemans Creek and groundwater contributions to the creek. Dr. Levison and her team, in collaboration with Dr. Marie Larocque and team at the Université du Québec à Montréal (UQÀM), are developing models based on data collected in the field in order to simulate Whitemans Creek's water balance. The models will help predict the effects of climate change on the creek and its watershed and also elucidate the impacts of potential increased irrigation in the area. Results from the study can support management decisions towards sustainable water usage in the watershed.